Montana Whitetail. 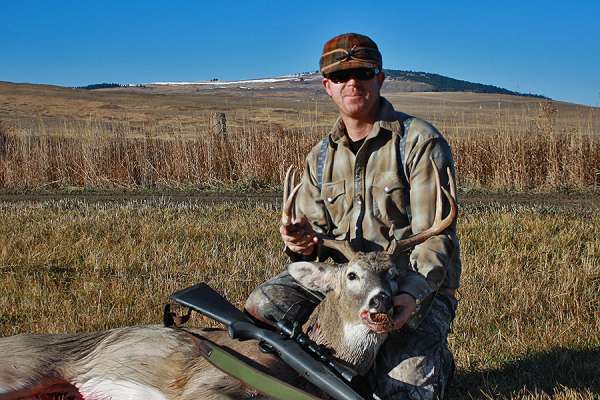 Son Todd got this whitetail near Wilsa, Montana in the Crazy Mountains last Saturday. Very nice buck!!! He's squared up very evenly too. Nice buck and some beautiful scenery also! I don't expect to have much success this year, but I'll be going up and enjoying it anyhow. You need to have deer to fill a tag. My Sons all amped up about this years deer hunt in Tenn. I'd love to see him bag his first deer but truthfully I think bambi's safe. 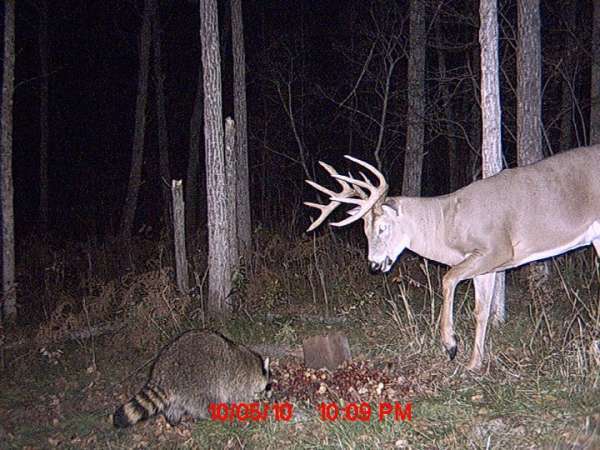 Here's a fresh pic off of my buddie's trail cam, I think he's hoping it shows back up opening morning! I'd like to take you up on that some day. Our first Youth day is today. They get to hunt with rifles during our first Primitive Weapons season. I hope that my two youngest Grandsons are able to go this afternoon. If they do the youngest gets to go with me I get to go with the youngest. Yea, Marty called. Ben goes with him and I get to go with Luke. I love it when a plan comes together. We got to the cabin about 2:00. Luke and I saw over 20 deer which included 8 bucks. One was a very nice mature 8 point. The others were 6's, forkies, and spikes. No shots today, but this was opening day. The season goes until January 31st. Luke, Marty, and Ben getting ready. These two were less than 30 yards away. Filled an antlerless permit yesterday afternoon with the bow, so now have to get at cutting it up. I finally was able to get a buck bow hunting. Shot this one Saturday morning. I'll probably leave for the cabin sometime this week. Season starts a week from today. First year in a long time when I just dont care of I go. Maybe my focus should be coyotes, but legally I cant shoot them during rifle season unless they are "doing or about to do damage" which as far as I am concerned, always. We have so many deer here, they are like rats with antlers. They do a tremendous amount of damage to our crops every year. We feed them and shelter them every year and the DNR refuses to give out detriment tags, claiming the deer belong to the state right up until the minute you hit them with your car. Jeff, you should head southwest first to Iowa and then on to Nebraska for your fill of deer. Jeff, I just don't care anymore, either, shot my last deer some 5 years ago. There was a moment after I shot him that I felt "Well, that was fun, don't think I want to do that anymore". In teaching hunter safety we teach the stages a hunter goes through, or most hunters. The last one is not to kill but pass on the knowledge and skills we may have learned. We have a team teaching approach that all told represents about 200 years of hunting. Lots of good stories there to pass on to the kids. Jeff, every coyote I have ever shot had an evil gleam in its eyes. Same for crows. Hope and Change, my foot, It's time for Action and Results! I'm on a coyote shooting kick now. Coyote = 1 bullet and a ditch. As far as I'm concerned, there is no season. Page created in 0.792 seconds with 40 queries.